I recently went to Richmond Station for dinner with a girlfriend, opened by last year’s winner of Top Chef Canada Carl Heinrich and Ryan Donovan of West Side Beef. I had high expectations for it and it didn’t disappoint. First up, the bread, I usually don’t even touch the bread at all but after trying it with the soy bean oil, I made sure I ate all the bread. 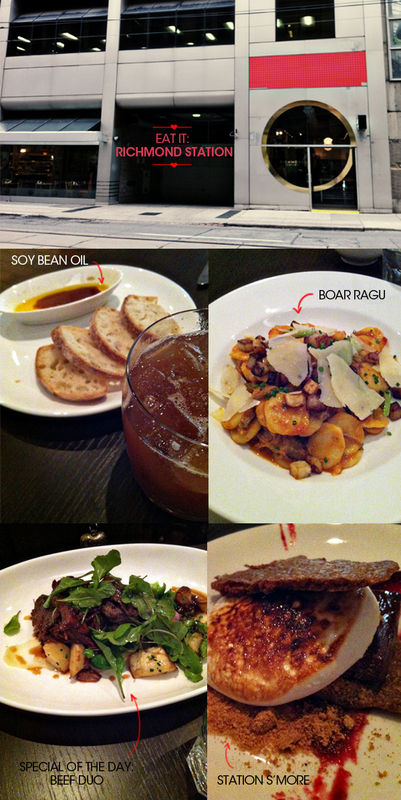 I had the boar ragu which was delicious and just the right portion. My friend had the beef duo, which were two cuts of beef, both very tender and on a bed of potatoes. I loved the sauce on hers. We finished it off with the Station S’more which I highly recommend, the graham cracker was handmade and had fried hazelnuts! I had gotten rush tickets earlier that day to Sister Act and we went to that after dinner. It was a lovely, fun and light musical that had me bebopping in my seat. I don’t think I’ve ever seen so much glitter on stage before, I was almost blinded!